Tips to Feed Your Newly Adopted Puppy - Petpav - Your Online Magazine for All Things Pet! When your first bring your new puppy home, everything is new to him or her. And you are just learning what your puppy likes, dislikes, and are trying to get him or her started on the right paw. And, of course, what and when to feed your puppy is among the most important things to consider. After all, providing the proper nutrition to your puppy is important for building strong bones and teeth, adding muscle, and supplying all the energy needed for play and learning. Puppies are growing rapidly, building bone and muscle, and developing organs. Adult dogs are maintaining their bodies. Your puppy needs extra nutrients to fuel his growth. Always start by getting a recommendation from your veterinarian. Try to find the healthier brands that have a protein base and less additives and fillers. After a month or six weeks on the food, assess your puppy’s health. He should be playful and energetic, with a shiny, thick coat. 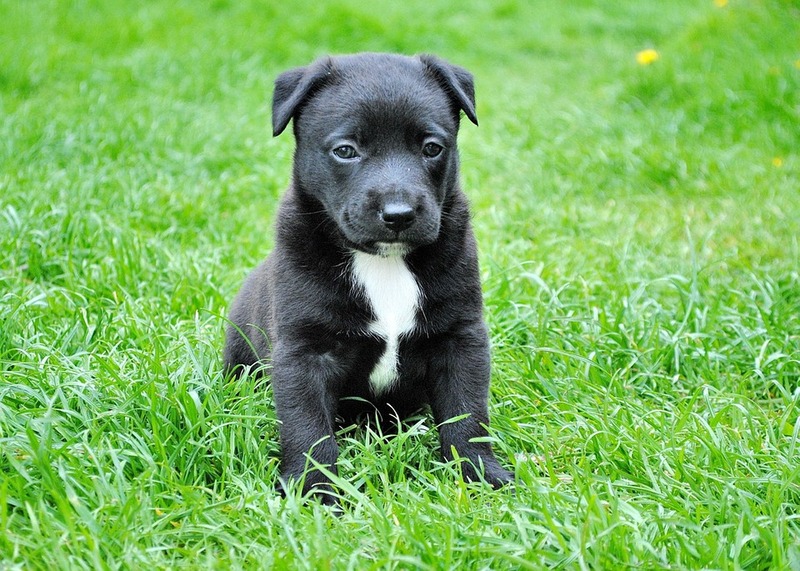 Formed brown, regular feces are a sign that your puppy is digesting most of the nutrients in the food. Puppies start on solid foods by about four weeks, when they’re not able to get all the calories they need from their mother’s milk. Most puppies are weaned by six weeks. Puppies should eat three times a day from weaning through four to six months, if possible. After six months, twice-a-day feedings are fine. But if you’re not able to feed your pup three times a day, don’t worry and you can feed your puppy before and after work. Puppies need to take in a lot of calories to fuel their rapid growth which usually means about twice as many per pound as an adult dog of the same breed. Puppies grow the fastest in their first five months. Look at the feeding charts on your puppy’s food labels as a guide. They provide recommended amounts based on a puppy’s age and weight. Adjust as necessary to keep your puppy in the best condition, something you may need to do weekly. It is important to be able to judge your dog’s body condition score in order to determine how much food you should give each day. The recommendations on the labels are guidelines only and will not apply to every dog. You may need to feed a little more or less depending on your dog’s condition score. Ideally you should be able to feel but not see the ribs and by looking straight down at your dog while she is standing there should be a recognizable waist. Ask your veterinarian if your dog is at a healthy weight during your next visit and ask how to assess your puppy’s condition at home. Puppy food is very high in calories and nutritional supplements so you want to switch to adult food once your puppy begins to approach maturity. Once puppies have reached 90% of their expected adult weight, they should switch from a puppy diet that is for growing to one that’s simply maintenance. Small breeds may finish growing by nine to 12 months; for large breeds, expect 12 to 18 months. There really is no set age when the switch should be made because it will vary with the breed and individual dog. In general, the smaller the dog the faster they reach maturity. Small breeds up to 30 pounds mature around ten to twelve months of age although some toy breeds reach maturity even sooner. Medium breed dogs up to 80 pounds will reach maturity between twelve to sixteen months. Large breed dogs weighing more than 80 pounds can take up to two years to reach maturity. Many pet owners like to reward their dogs with treats, especially when training them, but it’s best to limit them during puppyhood. Because puppies need so many nutrients to grow, it’s important to give them food that provides complete and balanced nutrition. A puppy should get most of his calories from puppy food rather than from treats, which typically don’t provide complete nutrition. Consider giving other types of treats to deepen the bond with your puppy. Healthy snacks like bits of carrot, green beans, or bell peppers give your puppy something to crunch without many calories. And just spending time with your puppy is the best way to bond with him. Keep your puppy away from avocados, chocolate, grapes, raisins, macadamia nuts, and raw bread dough made with yeast. Also avoid onions, garlic, and chives; milk and large amounts of dairy products such as cheese; alcohol; coffee and caffeine; salty food, such as potato chips; and food sweetened with xylitol, such as gum, baked goods, and candy. Xylitol, also used in products such as toothpaste, can cause liver failure in dogs. With a well-balanced diet and regular feeding, your puppy should thrive and transition into adulthood with ease! And, of course, keeping your puppy lean can avoid issues from being overweight.